The UK's premiere genre film festival is, without a doubt, Horror Channel FrightFest. A year round series of events that spread the love and passion for horror, FrightFest is the place to be for film fans across the United Kingdom. FrightFest has always been notable for the wildly creative new talents it has introduced to the genre film world, and with the recent announcement of this year's shorts film program - curated by our own mistress of the macabre, Shelagh Rowan-Legg - a familiar name among genre film fans takes his first baby steps into filmmaking. You might know Tom Hodge better as "The Dude", as in The Dude Designs, one of the foremost artistic talents in the world of custom film artwork. He's been responsible for creating memorable artwork for such films as Ti West's The Innkeepers and Jason Eisener's Hobo With a Shotgun, as well as bespoke pieces for films like The Heat, They Live, The Story of Ricky, Karate Kill, The Editor, Wolfcop, The Sacrament, Father's Day, and dozens more. At this year's FrightFest we will be introduced to Tom Hodge, director. Thomas Hodge is better known as 'The Dude Designs' poster artist behind; Hobo with A Shotgun (2011) The Innkeepers (2011) The Heat (2013) WolfCop (2014) The Other Side of The Door (2016) and They Live. He's also the author of VHS: Video Cover Art (2015) the first book of its kind to comprehensively bring together the artwork on UK VHS covers from the '80s to the '90s. Tom is now proud to present his first stint in the director's chair with 'Teddy Bears Picnic', a proof-of-concept short film selected to premiere at this year's Fright Fest in London (UK) http://www.frightfest.co.uk The film will then be released online shortly after for everyone to see. Tom describes the short as: "A year-long trip in terms of production but seven years of work in total. I opted to self-fund the film for possible development into a bigger feature. I've been hands-on throughout, donning many new creative hats to produce, direct, art-direct and edit for the first time. I spent months making props, building creepy woodlands and creating original costumes." Inspired by the 1907 melody of the same name, Teddy Bears Picnic re-envisions the childhood song as a nightmarish fable that twists the concept of childhood innocence. "I love horror as a genre for its pure unabashed creativity," says Tom. "It gives you a wider scope to create unique characters and settings. What are nightmares if not essentially creative? I particularly loved the creativity of high concept horror in the '70s and '80s – from the films of Charles Band to the pulp horror novels of Guy N. Smith. So I wanted to take classic character-driven horror and develop it to suit contemporary tastes, with a strongly stylised visual approach. I wanted to take that classic character driven horror concept and develop it for more contemporary tastes, with a strongly stylised visual approach, It was great being able to explore visual metaphors and themes in a new art form (film) that i truly love and have always aspired to work in. I'm very grateful to have been able to work alongside a very talented group of people to help realise the world of TBP on the screen for the first time. There really are too many to mention here, unfortunately! But I was particularly honoured to have Abby Miller come over from the US. I loved her in 'Justified' playing the role of Ellen May. And my friend the truly unique and iconic actor Laurence Harvey. Plus an incredibly young 6 year old actress Lorelei Winterfrost. I had some apprehensive comments about working with child actors but I can honestly say she was more well behaved than the adults. I also had the invaluable input of an amazing DP James Fox and the help/support from my co-producer Natalie Dorn, who also sacrificed a year for production. A musical score by Sophie Galpin (Pins-band) and sound design by Todd Freeman (Cell Count & Love Sick). Along with my co-writer Russell Norris. Filmed entirely on location in the rural woodlands of the English Northampton countryside. Here at Screen Anarchy we've been friends and fans of Hodge for many years and his enthusiasm for genre films as well as a documented deep understanding of what makes them work makes this a very exciting project for us. We can't wait to see it. 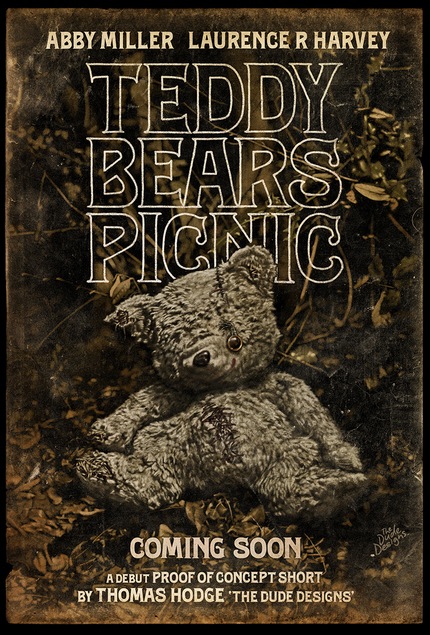 Teddy Bear's Picnic premieres at FrightFest on August 28th with an online release to follow.